When it comes time to choose a new floor, homeowners love choosing hardwood flooring because of its unique style and character. In fact, nothing seems to add style, luxury, and, more importantly, value, to a home more than hardwood. Tudor Carpet One Floor & Home in Valparaiso has your local hardwood experts, and we offer a great selection of high-quality styles. We consider hardwood an investment into your home, so it is important to us to help you find the best hardwood that suits your personal style and lifestyle. Just like any other flooring, hardwood comes in a variety of options. Choose from different species, finishes, and compositions that best suit you and your lifestyle. Hardwood comes in several different styles, species, colors and more for you to choose from for your home. Solid hardwood is a more traditional option or homeowners and features a uniform construction, as the wood planks are made from single strips of wood. These planks are thick so solid hardwood can be refinished multiple times. Engineered hardwood is made from multiple wood layers making it more dimensionally stable than solid hardwood. Engineered hardwood can be installed below, on, or above ground, and it can handle some levels of moisture and even floor-level heat. Although engineered hardwood is more durable than solid hardwood, we do recommend installing it in areas with low to moderate levels of foot traffic and little moisture. Bedrooms and living rooms are therefore suitable places for hardwood. It is important to remember that although hardwood is a durable flooring option, it does have its limitations when it comes to where it can be installed. For the most part, hardwood is the perfect flooring option for places like bedrooms, living rooms, home offices, and even your dining room. Solid hardwood should only be installed in on and above level rooms, whereas engineered hardwood can be installed in all levels of your home, even the basement. You should avoid installing any type of hardwood in rooms like bathrooms, kitchens or laundry rooms because of the high levels of moisture. At Tudor Carpet One Floor & Home, we offer only the best hardwood brands in the industry. We have styles of solid and hardwood flooring, so be sure to visit us and see our selection. Since we are part of Carpet One, we have exclusive brands such as Rustic River™, Invincible™ Hardwood, and Voyager™. To learn more about hardwood, contact Tudor Carpet One Floor & Home in Valparaiso, IN. At Tudor Carpet One, we carry both name brands and even Carpet One exclusive brands. That means you not only get exceptional value but also exceptional quality flooring. What are the Different Hardwood Styles? 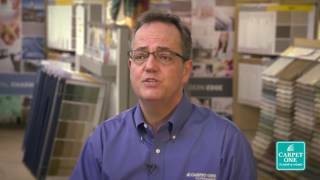 Watch and listen as VP of Merchandising Jim Aaron walks you through the different hardwood styles you can choose from for your home.